About Us - The Food Pantry of North Branford, Inc.
7The Food Pantry of North Branford, Inc. provides free supplemental groceries to any resident of North Branford or Northford. Proof of residency is required and is validated. Hours of operation: Wed. 4-6:30 PM, Fri. 10:30 AM-1 PM, Sat. 10 AM-12:30 PM. Our Phone Number is 203-208-2581. Registered customers may come once weekly during these hours. The pantry is not wheelchair accessible, however, arrangements can be made for an individual to have someone shop for them. Delivery is not available. 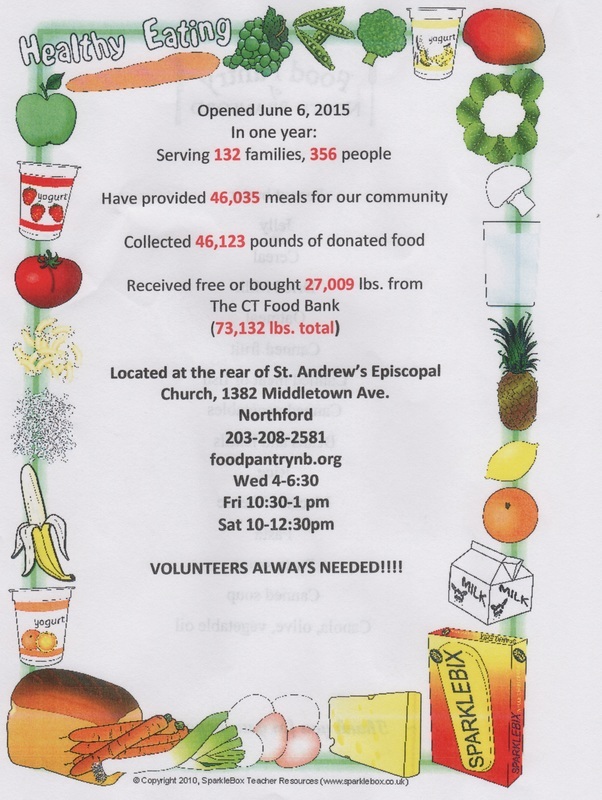 The Food Pantry is located in the Basement of St. Andrews Episcopal Church, (rear entrance) 1382 Middletown Avenue (Route 17), Northford, CT.
We opened on June 6, 2015. We provide supplemental groceries to any resident of North Branford/Northford. Proof of residency is required to register and is validated. There are no income requirements. We are a non-profit 501(c)3 corporation registered with the state of Connecticut and the IRS. We are a member of the Connecticut Food Bank which allows us to obtain food at a significantly reduced price or for free. April 2, 2016: Since its inception in June 2015, The Food Pantry of North Branford has provided 34,789 pounds of food to its clients. This translates into 28,990 meals. Thanks only to the overwhelming generosity of its supporters. ​There are, at this time, more than 58 volunteers helping their neighbors. Lynn Riordan, Founder of The Food Pantry of North Branford, Inc.
A North Branford mom is on a mission in the name of her late son Matt, to build a food pantry in her town to give back in his name and feed the hungry. Lynn Riordan formed the non-profit Matt’s Mission after her 18-year-old died in a car crash in 2009. He was going too fast and lost control. Riordan talks to other parents about keeping their kids safe on the road, and along with that she is pushing to build a place to end hunger in her town. “It’s important for me to prevent this from happening to other people’s families. I mean it was my first nightmare come true and I just don’t want to see it happen to anyone else if possible,” said Riordan. Matt’s Mission is expanding and Riordan is expanding it into a food pantry in North Branford. “Over the last five years, we’ve helped numerous people with Matt’s Mission, I think to date we’ve given back about $204,000 back into our North Branford community. And I do this because the love I received after Matthew died was just overwhelming. I mean you expect your family to love you and care for you and your friends, but from the superintendent on down, they wrapped their arms around me and they held me up in my worst time. An so I want to pay that forward and I want to acknowledge people who are struggling and one thing I’ve learned with Matt’s Mission is that people are hungry. People are hungry, we give out lots of coupons for Stop and Shop and Big Y, just in my town alone,” said Riordan. Riordan says those coupons help, but a bricks and mortar food pantry is the way to go to really feed her town and she is hoping she will get the help she needs to make it a reality. Look What We Did In Just ONE Year! That is 31.6 tons of food!